Tommy Mueller, a 2006 member of the Colts, sent this photo. This is a photo of me (right) and Brian Koerner. We are both trumpet players in the Symphonic Wind Ensemble at the University of Missouri and are seated next to each other in that band. I was a member of the Colts in 2005 and 2006, and Brian was a rook-out at the Madison Scouts this past year. 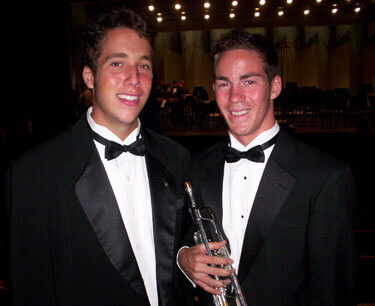 It is great to have a DCI person to play trumpet with in the off-season.